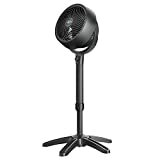 The Vornado 683 pedestal air circulator takes air comfort to the next level. With its unique signature grill and deep-pitched propeller, the 683 moves air up to 75 feet, while aerodynamically circulating all the air in a room. The 3-speed front-facing control allows for quick and easy Speed selection. The 683 features an easy-to-assemble, tool-free base that is designed for quick setup, takedown and storage and can be adjusted 32 inch – 38 inch in height. Backed by a 5-year satisfaction guarantee, if you’re not happy with the Vornado 683 pedestal air circulator, we will make it right.